Nothing's stopping from classic brands going out of their usual recognized comfort zone into making new products that matches the contemporary images of women. 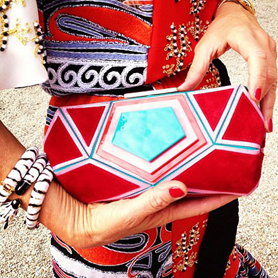 With the new street style and metropolitan trends vividly reflected from countless fashion show this season; I personally am really admiring the new take on clutches and shoes by Roger Vivier this year. Emphasizing on a boy chic vibe, their new Prismick collection gives off a hip and street friendly look, not to mention its uniqueness is incomparable with other items in the market. Showcasing here is the plastic Prismick clutch. With geometrical shapes of red and pink, the base layer is a metallic blue that elegantly plays off the velvet material on top. 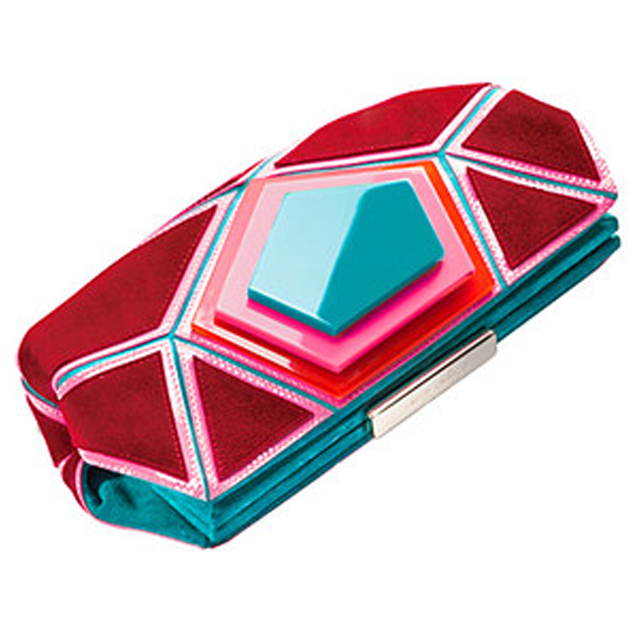 With one specific segment made from plastic; the 3D layering on the bag is clearly enhanced and poppy, making the clutch much more fun to the eyes than it already is. The unique shape seems hand held friendly, spacious and has a good amount of width for daily essentials. Overall, this new Prismick collection is definitely one of the must haves for this season, and a great item to be mixed and matched with evening dresses or just denim shorts. Is it made of flannel?